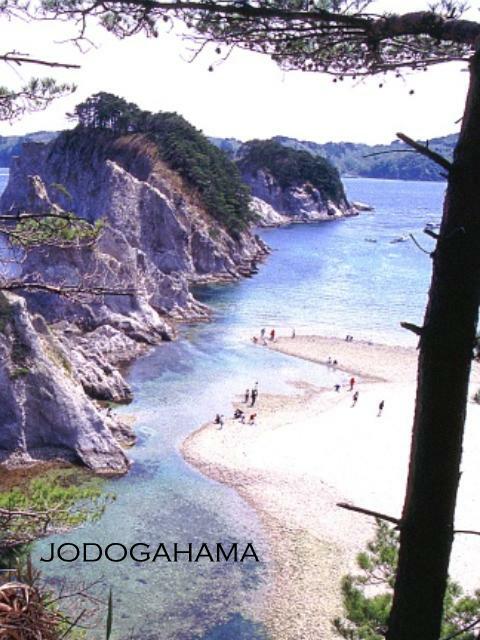 Jodogahama beach is located in the Rikuchu Coastline National Park. Part of its beauty is the contrast between the clear cobalt blue ocean and the white rocks and beaches. 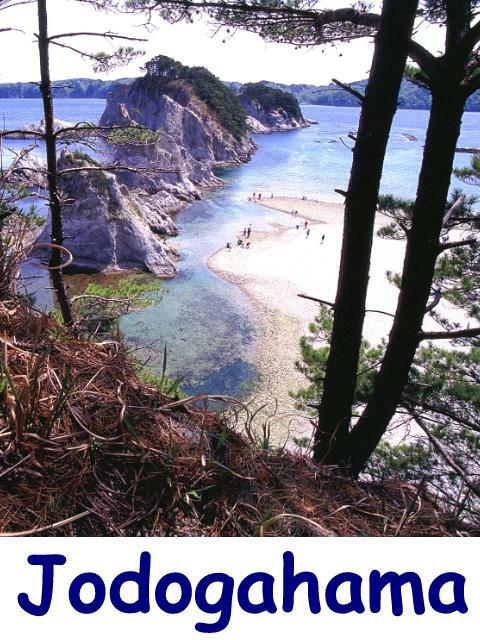 The coastline is irregularly saw-toothed with precipitous oddly shaped rocks and grottos as well as verdant pine trees. The area is famous for abundant hauls of seafood. Numerous eating-houses serve fresh shrimps, sea urchins, crabs, and other delicacies of the sea. 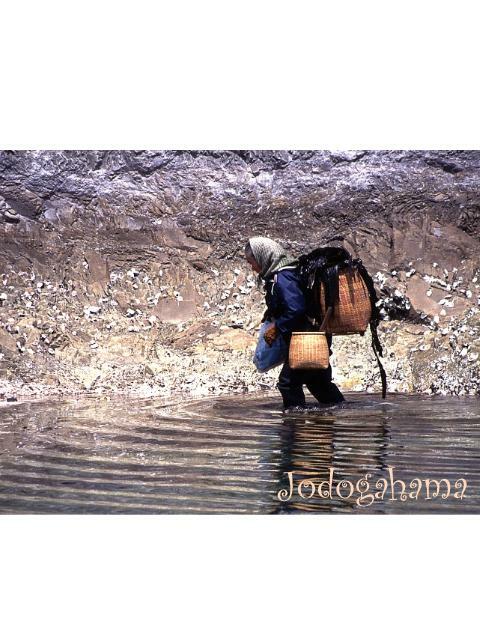 The name, Jodogahama, is said to come from the episode 300 years ago, when Reikyo, a Buddhist priest, visited the place. 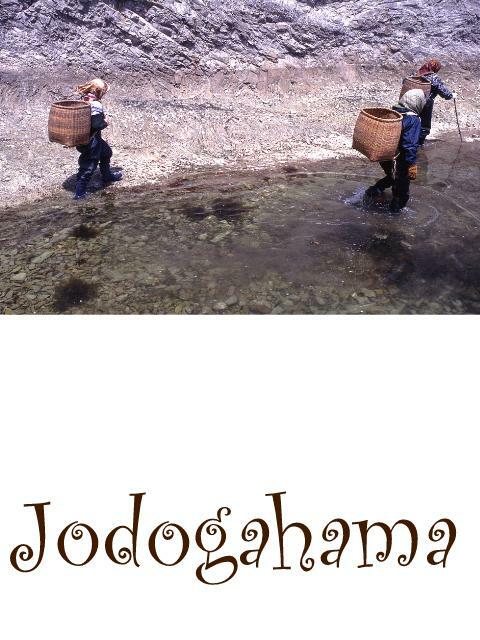 The unearthly beauty of Jodogahama inspired him to praise the beach likening it to Gokuraku Jodo (Buddha's Western Paradise). 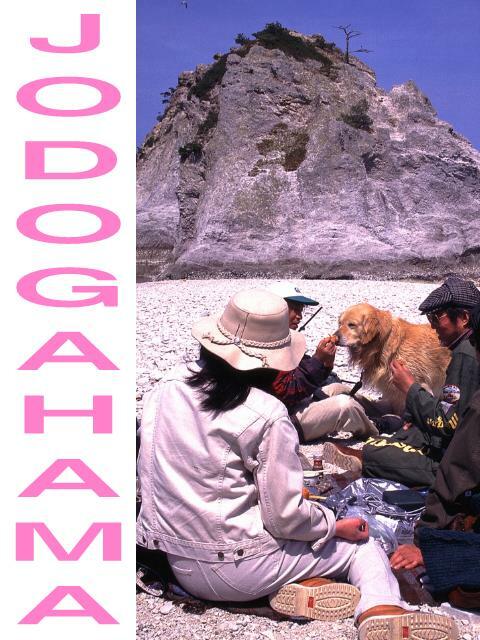 Jodogahama really is a place of sanctuary, the Land of Perfect Bliss. On the beach I saw three women carrying baskets. Soon they disappeared behind the rock formations walking to the sea. An hour later they came back smiling with their baskets full of seaweeds. 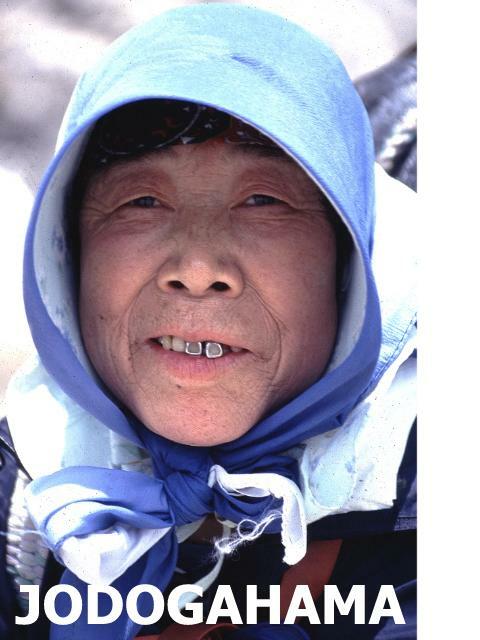 This is how in Japanese national parks people co-exist with the environment where they were born and brought up. As a contrasting effect to the natives, groups of town people enjoyed picnic on the beach, including the Morgan Sports Car Club. Satoru Araki, the president, 57 years old, invited me to join their group. I spent a good time with them. Satoru gave me a ride from Jodogahama to Kamaishi. Other Morgans followed us behind. Satoru explained me, all the while talking to other Morgan drivers by radiophone. This is Japan’s Norway. Look at this snaky line, like fjords, the most exciting driving course. In Kamaishi he asked me to send information about Finnish Morgan Clubs. In Japan twenty one species of seaweeds are used in everyday cookery, six of them since the 8th century. Most important are konbu, nori, and wakame. These sea vegetables are among the richest sources of vitamins on earth and retain a concentration of minerals, fibres and proteins. The seaweeds have been paid as tax since ancient times. Konbu is used in the preparation of fish, meat dishes, soups, sauces and also as a vegetable with rice. Powdered konbu is added to rice in the same way as curry. Konbu is also used in making tea called kobu-cha. 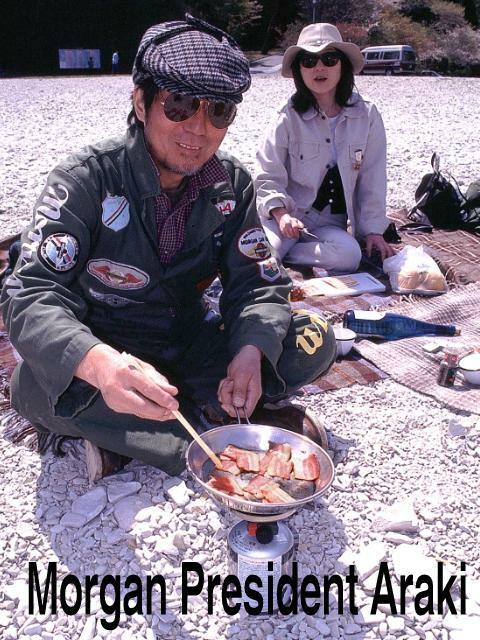 During the Asuka and Nara eras only the nobility consumed nori. During the Edo period Shogun Tokugawa Ieyasu ordered fishermen in the small town of Shinagawa to bring him fresh fish everyday. The fishermen built an offshore fence and started fish farming. They also found that nori preferred growing on this fence. 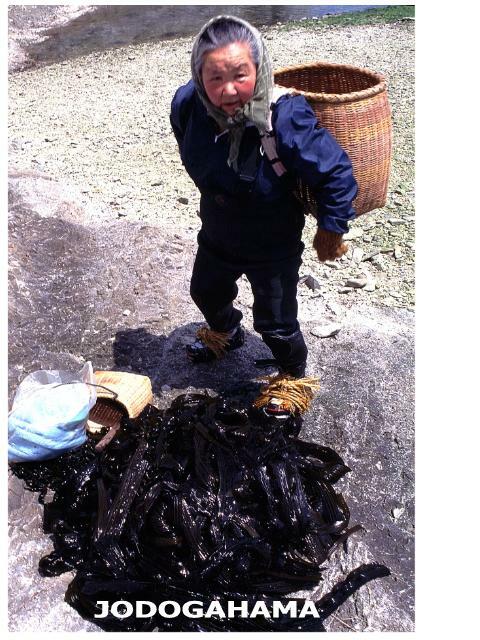 Thus nori aquaculture was born. Wakame is similar to konbu and often used dried or salted in miso soup and salads.